Claire Livingstone (L) reading the Bible with Aline. 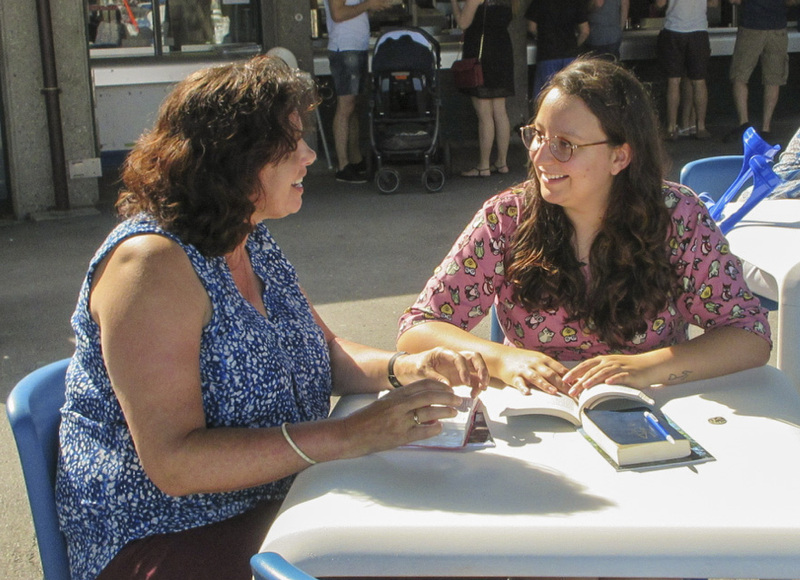 CMS missionary Claire Livingstone (serving with Andrew in Switzerland) began to meet with Aline to read Mark’s gospel. Aline was provoked to find out more by the death of her grandmother, who had a strong faith in God. Read Aline’s story and discover how she has become ready to share the peace she received with others. What initially prompted you to find out more about Jesus? Grief prompted me. I lost my grandmother last year, but she was also my best friend. She was a Christian and I thought that seeking out what she so firmly believed would make me feel closer to her, and it has—but mostly it’s helped me be closer to God. If I’d started reading the Bible by myself randomly, or even from the beginning, I think I’d have been discouraged easily by not understanding. Having someone guide me has helped really open up my heart to Jesus. How has our meeting one-to-one together been helpful for you? It’s been helpful to have someone explain the context and the big picture of the Bible. You helped me understand I needed to think about who Jesus is, and to first read about his life, death and resurrection before reading other parts to get the broader picture. Starting with Jesus was essential, and the questions you asked helped me to read and think at a deeper level, rather than at a superficial one. How would you say God has grown you over the past few months? Before my grandma passed away I was happy but I always felt restless inside. Now I’m not as happy, but I’m calmer. I can trust God with everything I feel, everything I fear, everything I doubt—and feel peace in my heart—like it says in Philippians 4. My grandmother was always my anchor but now I know that God is an everlasting anchor. He holds me in place and gives me roots. Jesus gives me unconditional love and grace. I can trust his love in all circumstances—that’s what gives me peace, even with the worries of daily life. It helps me have a certainty in life. Can you imagine reading the Bible with someone else in turn to help them discover Jesus? Yes! But what I appreciated with you was that your friendship with me wasn’t conditional. The grace and love that you showed me really moved me and gave me the encouragement to meet and explore who Jesus is. God gives us grace, so who are we not to give grace to others? Andrew and Claire will return to Australia permanently in November 2017 for Andrew’s new role with CMS Victoria. Find out more at cms.org.au/news/livingstone. Would you consider working in Europe alongside a national student movement? Libby Leach, another recently returned CMS missionary, wrote about the French GBU, which has seen long-term involvement from CMS. Read about the possibilities here.